This is the first wooden sweet potato I have made with this layer design. It takes more re-sawing, but the result is worth the effor. Morado, also known as Bolivian rosewood, grows in the tropical regions of South America. It is truly one of the morst beautiful woods available today. I especially like it with these maple accent layers. The Alto sweet potato has a sweet, melodic sound. The Ocarina Hymn Book contains dozens of all-time favorite hymns. Click the image at left to view the table of contents and choose options before ordering. The Ocarina Christmas Book contains all of your favorite Christmas Carols in easy to read format. Click the image at left to view the table of contents and choose options before ordering. The Ocarina Songbook contains many favorite folk songs along with a few marches and hymns. Click the image to see the table of contents and choose options before ordering. 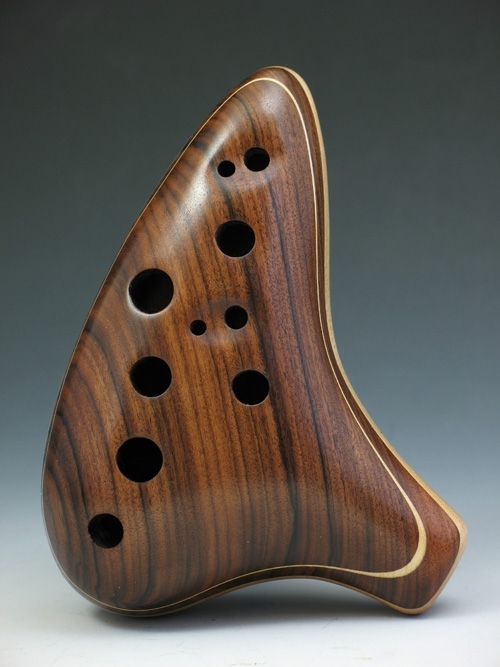 This hardwood display stand will showcase your ocarina perfectly, so that it can be proudly displayed in your instrument collection or music room. Click image at left for larger views and more information. OUT OF STOCK---This book traces the history of the ocarina from its earliest beginnings to the present day. Click the thumbnail at left for larger views and more information.